Samsung has been all over MWC 2013 with a slew of new products, but the one that has been garnering a lot of attention is not a mobile one. Galaxy Tab and Note users have a new companion this morning with the release of the HomeSync 1TB Android Media Box. The sleek looking silver box pushes Android Jelly Bean (Samsung did not specify which version) to your HDTV and looks like a convenient way to access apps, photographs, and videos from your mobile phone or tablet. 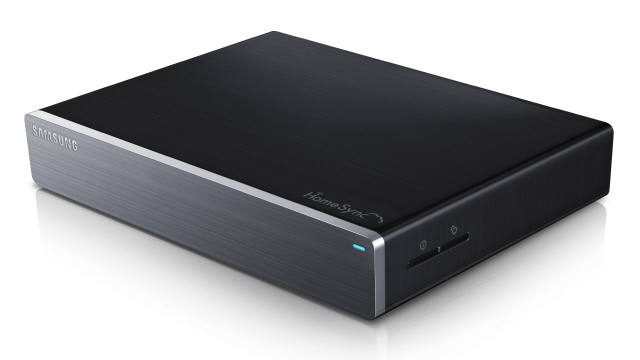 The HomeSync is powered by a 1.7GHz dual-core CPU and includes 1 HDMI 1.4 output, an optical digital output, 1GB of RAM, 8GB Flash memory, 1TB HDD, Bluetooth 4.0 compatibility, Gigabit Ethernet support, and 802.11n 2.4 and 5GHz WiFi. Samsung did not specify if the HomeSync will work with Google TV, but users will have access to the Google Play Store through the box. The HomeSync will output video at 1080p to your HDTV via the HDMI 1.4 output and will support up to eight separate password protected and encrypted accounts which each individual user can use to sync content and share with other users. There is no word yet on whether the HomeSync will support WiDi or Miracast but expect to see the HomeSync in select markets, which includes the United States starting in April. Samsung did not specify a price but we wouldn’t be surprised to see the HomeSync close to $200 at launch.